Copenhagen secured its place as a cyclist’s mecca with an innovative bike library. Photo courtesy Carrie McKee. 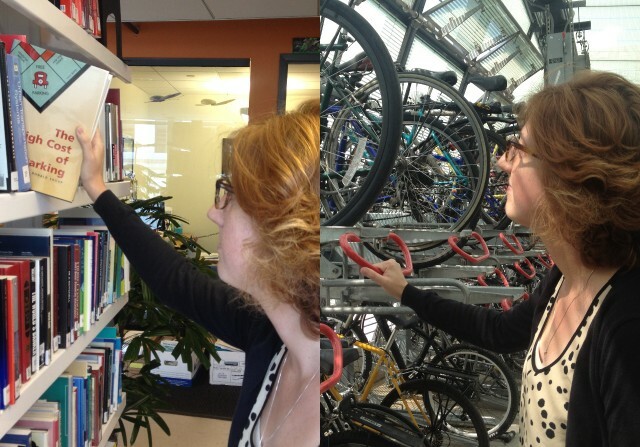 What if you could check out a bike like a book from a library shelf? The question, thanks to the Bicycle Innovation Lab, is not “if” but “where.” The Copenhagen cykelbiblioteket, or, in English, “Bicycle Library,” will loan you a bike for a returnable deposit of 500 Danish kroner (US$80), or slightly more than a library card. Checking these bikes out only requires booking a day in advance with confirmation provided by text message. How novel! The collection of bikes ranges from the weird to the wonderful, including standard road bikes and locally designed theme bikes. The genres include standards like recumbent bikes and racers, as well as the more eclectic “conversation bike,” a three-person tandem plus trike. For Copenhagen’s rainy weather, the ultimate bike library acquisition for staying dry and mobile is the velomobile, a three-wheel bicycle with a banana-esque body and sun-visor window. Note: the Bicycle Library requires you must be between about five feet and five-and-a-half feet tall (150cm-170cm) to ride in the velomobile, so tall Danes and visitors need not book it. 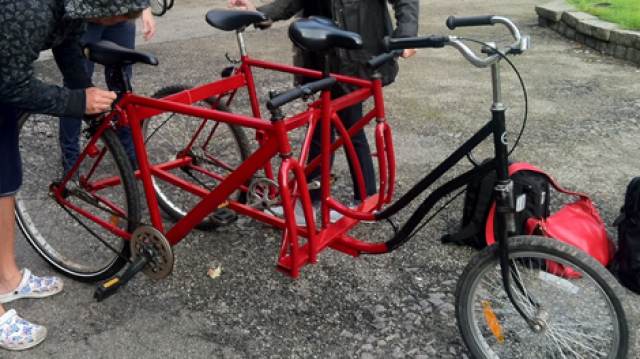 The Råderum-designed conversation bike. Image by Bicycle Innovation Lab. The Bicycle Library proclaims, “we will expand your bicycle horizon,” a slogan that complements well with the broader bicycle infrastructure of Copenhagen. Just two weeks ago, TheCityFix wrote about the range of cycling options across Europe and in Copenhagen. The capital of Denmark has it all: bikeshares, bike lanes, its first “cycle superhighway,” and now, a cykelbiblioteket to smooth out the quirky edges of bi-, tri- or quadrupedal mobility in the heart of Scandinavia. Friday Fun: The One-Wheeled Motorcycle? Friday Fun: Kickstart Bicycle Innovation!